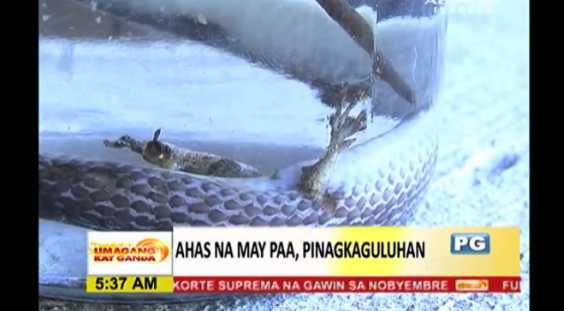 ISABELA, Philippines – A very unusual snake having feet, which resembles those of monitor lizards’, is catching the netizens attention, after it was caught in one village in Mallig, a town in the province of Isabela, Philippines, as reported by ABS CBN News. The strange creature was caught while roaming within the house of Gambol’s family in Barangay Olango in Isabela. According to Noberto, the head of the family, he was cleaning their house when he noticed the snake on the floor. As the snake felt his presence, it went inside a carton box, where Norberto was able to k**l it. After making sure the snake is d**d, Noberto check its l******s body and he was amazed when he discovered that the snake actually have feet. The locals in the community have different superstitious beliefs regarding the snake; some saying it is bad luck, while others treat it as a fortune giver. Meanwhile, a forestry scientist explained that there is a big possibility that the presence of feet on that particular snake was due to genetic mutation. The Gambol family decided to have the unusual snake preserved. This is not the first time that snake with feet made some news. In 2009, 66 years old Duan Qiongxiu from Suining, China discovered a reptile clinging to the wall of her bedroom, with its feet-like talons in the middle of the night. The unusual snake measures 16 inches long, with the thickness of a little finger. “I woke up and heard a strange scratching sound. I turned on the light and saw this monster working its way along the wall using his claw,” Duan told in a report by The Telegraph. Duan was so scared after seeing the snake, that she impulsively grabbed a shoe and beat the snake to d***h. Afterwards, she decided to preserve its body in a bottle of alcohol. It was then forwarded at the Life Sciences Department at China’s West Normal University in Nanchang so that it can be studied.